Even though some experts continue to see India as a factor-driven economy [depending primarily on natural resources and unskilled labour as base of economic activity], in the recent years the country has progressively moved towards being an economy driven by knowledge and innovation. The added emphasis on innovations is a direct result of consumer aspirations as people increasingly demand innovative products and services from a competitive market. This demand is fulfilled on one hand by leveraging the technological prowess of India’s own scientific pool, and access to global knowledge on the other. While this is still an ongoing process with promising prospects, there is also a need for greater assertiveness and less risk-aversion in firms, if the true potential is to be realized. 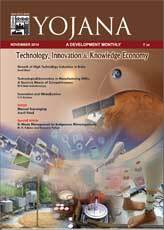 This article examines the proposition, whether India actually remains a factor-driven economy or whether it, at least partially, has already begun its transcendence up the value chain, and if so, what are its achievements, what are the challenges associated with such a transformation and, finally, what are the prospects for its progress into being an innovation-driven economy. To seek an answer, we will look into the scene of research & development, higher education and innovation in India. Furthermore, we will examine the trends in foreign trade and analyse the challenges and prospects for India. This entry was posted in English, Publications, Uncategorized and tagged India, Innovation Strategy by Rajnish Tiwari. Bookmark the permalink.